Once the shell script exits, its environment is destroyed. 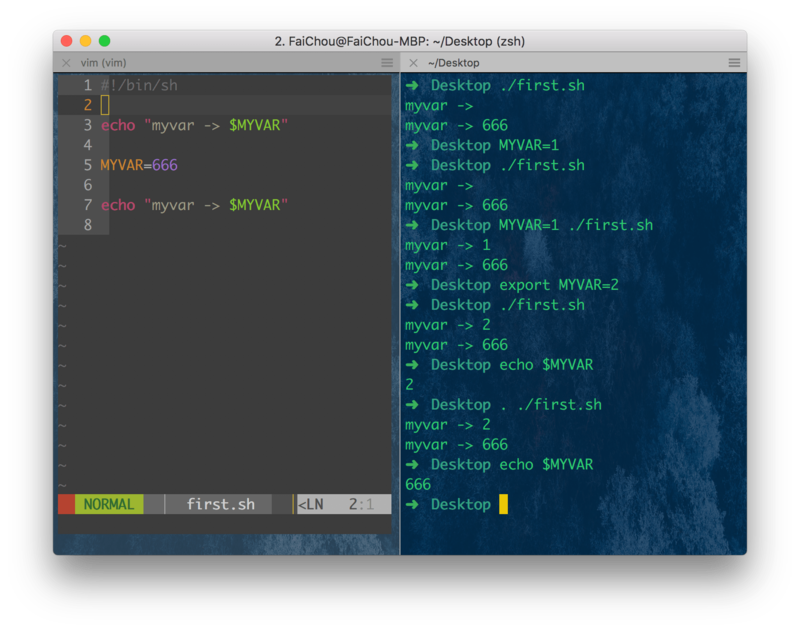 But MYVAR keeps its value of hello within your interactive shell. In order to receive environment changes back from the script, we must source the script - this effectively runs the script within our own interactive shell, instead of spawning another shell to run it. We can source a script via the ”.” (dot) command. Pipe is used to pass output to another program or utility. Redirect is used to pass output to either a file or stream. $ echo "img/a.png img/b.jpg" | grep -oE "\/.*?\. (png|jpg)"
-P —perl-regexp Interpret the pattern as a Perl-compatible regular expression (PCRE). This is highly experimental, particularly when combined with the -z (—null-data) option, and ‘grep -P’ may warn of unimplemented features. See Other Options. Default GNU grep behavior is to use a slightly flavorful variant on POSIX basic regular expressions, with a similarly tweaked species of POSIX extended regular expressions for egrep (usually aka grep -E). GNU grep also claims to support grep -P for PCRE, by the way. So no terribly special kind of grep required. # replace HEADER_SEARCH_PATHS to blabla..
find current direction recursively all ts, tsx, js file which contain require( line. 之前博客里有学习过 convert 命令, 很强大的图片编辑转换工具, 配合 composite 处理图片简直不要太爽. 这样启动 ngrok start --all 就可以转发两个端口(3000和3001).